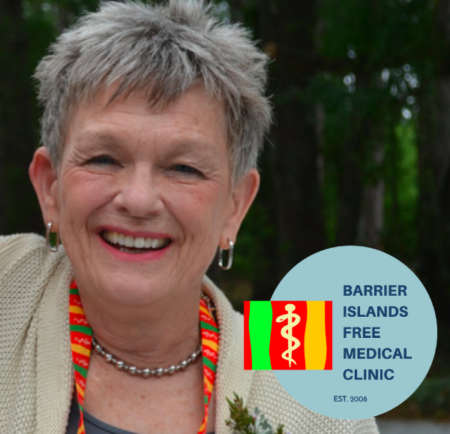 Barrier Islands Free Medical Clinic is poised to meet the demands of many more without health insurance in our community. The catch? Catching them. Engaging in an outreach effort to educate potential patients about BIFMC’s free services, Volunteer Cynthia Cronk hits the streets. The past two years have entailed tremendous growth and publicity for Barrier Islands Free Medical Clinic, appearing in the local pages of the Post & Courier, Charleston Magazine, Healthlinks Magazine and more; as well as three BIFMC members, Cynthia Cronk, Dr. Ulmer and Dr. Agusta, receiving prestigious area accolades; Cynthia Cronk and Dr. Ulmer were both the recipient of Charleston’s Health Care Heroes Awards, and Dr. Agusta the Angel Oak Award. Now, with the opening of a brand new, seven exam room free medical facility on Maybank Highway, the clinic hopes to keep the good word spreading – and extend their hand to many more in the community without health insurance. While media publications and online advertising is a boon to promote what the free clinic offers and who is eligible, Outreach Volunteer, Cynthia Cronk, has embarked on a parallel mission: to spread the message of free health care to local grass roots organizations, local partners, and places of worship – hoping that some good old fashioned word of mouth will help to inform and build trust within the community. Cronk explains how she plans to continue her outreach mission – and how anyone can be a part of the “boots on the ground” movement. BIFMC: We have much more space in our new clinic. what does this mean for our outreach efforts, and how have we attempted to vamp up our communications to those in the community without health insurance – many who may not find us online or in the media? Cronk: The new clinic space is 7000 square feet and holds seven, well-equipped examination rooms. We have dedicated space for our volunteer doctors and nurses to work in our new clinic. And, we have a beautiful new waiting room with ample space and comfortable seating (lots of parking as well). We can easily see more patients each day and, as a reminder, we are open Monday through Friday and we welcome new patients. We know that many of our patients work – sometimes one or more jobs and are without health insurance. We are reaching out to local businesses to tell them about the clinic and ask those businesses to share the information with their employees who may not have health insurance. We are also visiting all the public schools on Johns, James and Wadmalaw Islands to get the word out to school nurses and guidance counselors that the clinic’s services are available to school children’s parents and families who may not have health care. And, we have sent letters to the churches on the three islands to ask church leadership to share the news about our clinic with their congregations. We have done some local outreach at farmers’ markets, libraries and community events. We are happy to attend an event or meeting – all we need is an invitation! BIFMC: Engaging community partners and churches is important to us. How can other services and faith based communities help us spread the word about our clinic? Cronk: We know that, for many people, the church plays an important part in their lives. BIFMC would like to share with local churches what we do and how the clinic operates. We want people to know that if they are eligible, our medical care is free as are any labs or imaging services that might be needed. And, we have staff and volunteers to help guide potential patients through the eligibility process – it is really quite easy and can be done efficiently. Churches and members of their congregations can help us by inviting us to services or prayer meetings or church events so that we can share our message and answer people’s questions. We also want people to know that the clinic staff and volunteers treat our patients with dignity and respect. We want people to feel comfortable coming to the clinic and we want people to have healthier lives. In short, we want to provide the kind of medical care that anyone of us expects when we visit our doctor’s office. The clinic wants to become the medical home of uninsured men and women of these three islands, and to continue to build trust in the community. BIFMC: What do you think would surprise prospective patients about the services we offer? Cronk: The most striking thing about BIFMC is that it looks and feels like any medical doctor’s office anywhere else in Charleston – or in the country for that matter. The building is brand new and the volunteer doctors and nurses are friendly and compassionate about patient care. The staff will greet you with professionalism and respect for patient privacy. Patients have short waiting times and it is easy to get an appointment. If a patient needs Spanish language interpretation, the clinic provides that service as well. Overall, staff and volunteers at the clinic want patients to feel comfortable, safe and well-cared for. And, we want to provide our patients with the best possible medical care and advice. We believe everyone is entitled to the best medical care possible and our staff and volunteers want our patients to return regularly for ongoing medical care and support. BIFMC: If people reading this have a connection to a church or community org, how can they help us extend our information to their community? Cronk: We want the community across the three islands to learn about BIFMC. First, we invite and welcome anyone to visit the clinic and see how our services work and how our patients are treated. Get to know us and find out more about our work with high-risk diseases such as diabetes and hypertension. Learn what the clinic is doing to help women over 40 get free mammograms. Find out about our prescription assistance program to help make medicine more affordable. Learn more about our doctors who are specialists in cardiology, dermatology, urology, psychiatry and more. We would be most grateful if you could become ambassadors for the clinic, returning to your congregations and places of business to help tell the clinic’s story. Encourage people to seek medical care and help your parishioners with transportation to the clinic if needed. Go to our website: www.bifmc.org and learn even more about us and about health and wellness issues. Invite us to your events or ask us to meet with church leaders to further explain what the clinic does. Help the clinic grow and reach people on these three islands who need outstanding health care and who are uninsured. Working together, we can make sure that those in need have access to quality care.